1. Log into Moodle 3 and go to the desired course. 2. Select the desired assignment that needs to be graded. 3. Under Grading Summary and select Grade. 4. Scroll down to the Grade Section. In this section, the instructor can give a grade ranging from 0 to 100, provide feedback comments, provide feedback files, and has the option to notify the student with a yes or no drop-down menu. Selecting Next will bring you to the next student's assignment. 5. When the grading is completed, select Save Changes found at the bottom of the page or select Save and show next to save changes and go to the next student's assignment. 3. Under Grading Summary and select the View All Submissions button. 4. Scroll down to the Options section and select the Quick Grading checkbox so that it changes from unchecked to checked. 5. The page will reload with a textbox inside the Grade column of the assignment submission page which allows the user to input a grade between 0 and 100. 6. 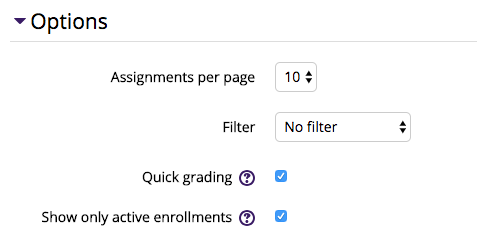 When all quick grades have been entered, scroll to the bottom of the assignment submissions and select the Save all quick grading changes button. NOTE: There is an option available to notify the student by email once the assignment has been graded. 1. From the top of the assignment page, select the Grading Action drop down menu and choose Download All Submissions. This will download a .zip file containing all the files submitted by students and organized in folders corresponding to each student's submission. NOTE: If the Download All Files option is chosen, a .zip file containing all submitted files will be downloaded, but they won't be organized by submission. 1. 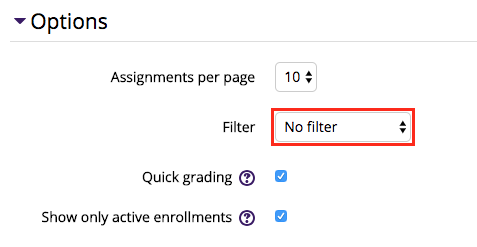 To filter the submissions on the assignment page, scroll down to the Options section and select the Filter drop down menu.